One of the most striking images from the disaster is that of the orchestra playing as the ship sank. Survivors of the ship witnessed one of the greatest acts of selflessness and courage when Wallace Hartley and his string ensemble played music on the upper deck soon after the Titanic struck the iceberg in order to calm the passengers. Though the ensemble did not play the eponymous popular song, the phrase has been a favourite in newspaper headlines ever since. It was also the title for a famous book about the early history of HIV/AIDS by Randy Shilts. Only 10% of an iceberg is visible above the surface of the water. Used metaphorically the phrase refers to hidden danger. Recent research suggests the phrase was unusually resonant in the disaster: 'the ship crashed because the iceberg was disguised by an optical illusion' - see here. The first recorded use is in the novel Harrington: A True Story of Love by William O’Connor written in 1860. The phrase was popularised, however, by the famous order issued by the captain of the Titanic, Edward Smith. What Captain Smith precisely meant by this order caused a catastrophic confusion onboard and probably caused at least a hundred unnecessary fatalities. In recent years there has been a lot of emphasis on the social class element of the disaster. Were the first class passengers favoured over those travelling Second or Third? This marketing slogan proved tragically hubristic. 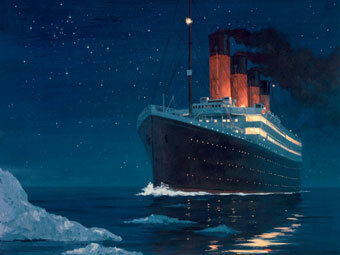 No ship is 'unsinkable' and the design of the Titanic made it catastrophically vulnerable - see here. This phrase - meaning to engage in trivial actions in the face of a disaster - is first recorded in the US in the 1970s - see here. It has now become a popular cliche - particularly for British politicians.